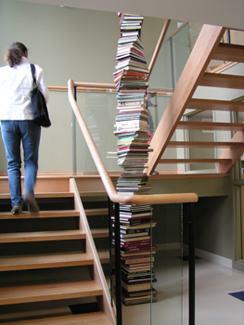 A single, twisted column of used books occupies the main stairwell of the Chelsea municipal library. 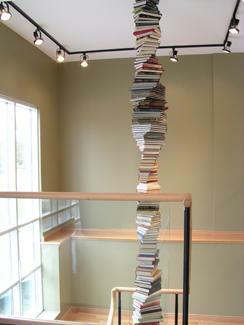 Six meters in height, this column reaches from the ground floor to the ceiling of the second floor. 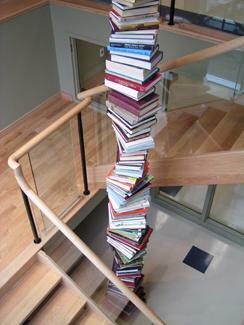 The illusion of balance is achieved by threading 400 books onto a steel pipe. The inventive meaning of thought and the initiative role of knowledge and of learning as it is passed on from books through the power of words on the imagination. 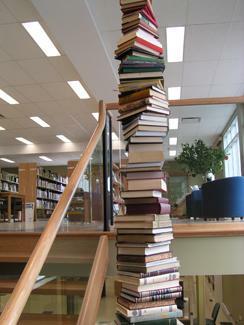 As a whole, the artwork evokes the Tower of Babel and the Tree of Knowledge.